FORT MEADE, Md. (AP) — An unauthorized vehicle tried to enter the secure campus of the National Security Agency at Fort Meade on Wednesday morning, sparking a confrontation that left three people injured, authorities said. Gunshots were fired during the incident, but officials said they did not believe any of the injuries resulted from gunfire. Gordon Johnson, special agent in charge of the FBI’s Baltimore field office, would not give details about who opened fire but did say that, preliminarily, it looks like all gunfire was directed toward the vehicle. At a news conference Wednesday afternoon, Johnson said the FBI was still collecting evidence but believes it was an isolated incident. “I cannot emphasize enough that we believe there is no indication that this has a nexus to terrorism,” Johnson told reporters gathered at a parking lot next to the National Cryptologic Museum. Johnson said the three injured were the driver of the vehicle, an NSA police officer and a civilian onlooker. He would not give any details about how they were injured. Two other people who were in the vehicle have been taken into custody and were being questioned, Johnson said. The injuries suffered by the police officer and the onlooker did not appear to be life threatening, he said. He did not have any information about the driver’s injuries. 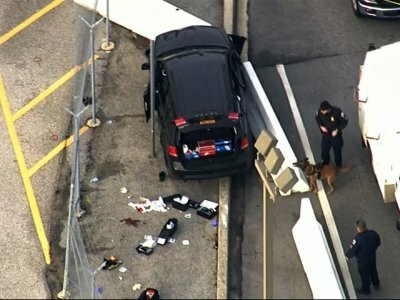 Images from local news outlets showed authorities surrounding two handcuffed people after a black SUV ran into a barrier outside the Maryland base. Johnson said the vehicle had New York license plates and he believed it was a rental car. He said he did not know why the people in the vehicle were at the facility. President Donald Trump has been “briefed on the shooting at Ft. Meade,” and the White House offered thoughts and prayers with those who have been affected, spokeswoman Lindsay Walters said. An image taken from a WRC-TV helicopter showed the police and fire department response outside the facility. WRC said bullet holes could be seen in the vehicle’s front window, and air bags were deployed. Blood-stained material could be seen on the ground. After the shooting, authorities closed a major highway in both directions, causing major backups throughout the area during rush hour. Despite prominent highway signs, drivers occasionally take the wrong exit and end up at the tightly secured gates. Most motorists then carefully follow the orders of heavily armed federal officers and turn around without getting into more trouble. But in early 2015, two people were shot at by NSA police when they disobeyed orders outside the heavily secured campus. One driver died at the scene after NSA police opened fire on a stolen sports utility vehicle. Authorities later said they had stolen a car from a man who picked them up for a party at a motel.